It’s time to turn our companion-loving eyes toward the ones we can’t actually see. 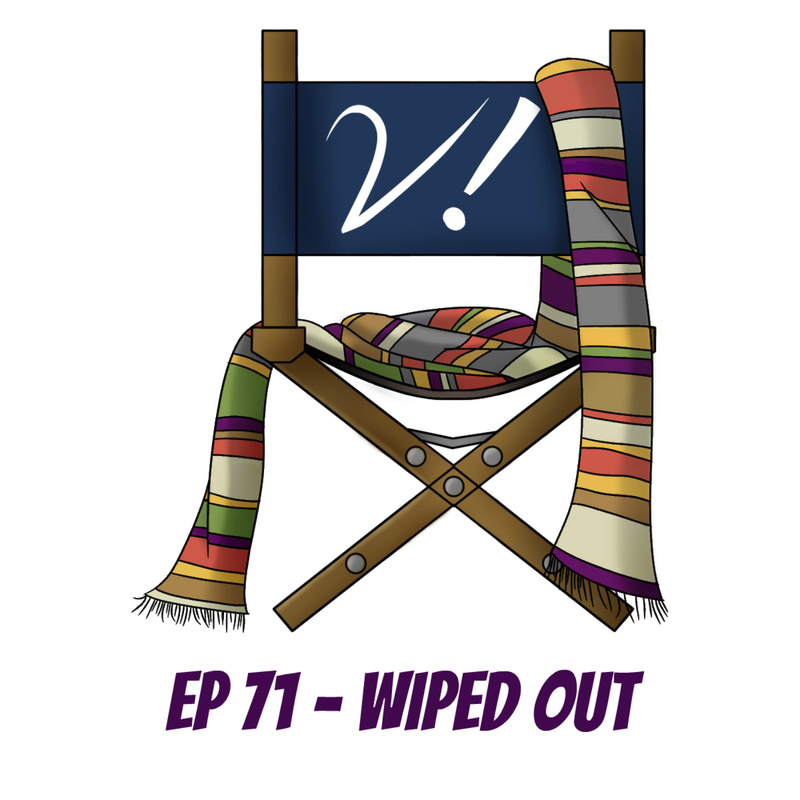 Join Deb, Erika, Liz, and Tansy as we talk about the companions who have missing episodes. Some are missing more eps than others. Does that affect how fandom feels about them? Does it affect how we feel about them? How do we like to consume the missing stories? And what are good places to start for someone who’s never tried? All this and more! Are you a lover/hater/defender of the companions whose episodes are missing? Do you like the telesnaps? Audios? Novelisations? Let us know in the comments! Liz discovers a couple Skyrim mods to include a TARDIS! Tansy receives geeky cake sprinkles, including teeny police boxes! fawns over the Greatest Spreadsheet Ever, courtesy of listener Jonathan Young! listens to Breaking Bubbles and Other Stories, and enjoys Liz’s first Big Finish audio! enjoys the first 9th Doctor comic! delights in all the upcoming Doctor Who conventions, including (Re)Generation Who and LI Who! As someone working through Classic Who from the beginning, that spreadsheet sounds amazing. And also, as someone working through Classic Who from the beginning, I can’t wait for Erika’s new podcast!! (I’m currently on The Time Warrior!!) Thanks, as always, for the podcast! Not much to say about the podcast, except that it was good to hear a long conversation about the companions from that time. You covered a great deal of ground, even a little beyond what the episode was mainly about. I don’t know if you’re aware, but there will be a new Doctor Who con in Wichita, Kansas, this October, called Time Eddy. I’m hoping the best for it. Among the guests will be Colin Baker and Nicola Bryant. Here’s the link to their website: http://www.kansasdoctorwho.com. On the subject of lost episodes and companions…I personally adore the Loose Cannon reconstructions. It led me to read a great deal about the concept of telesnaps, and I also have an enormous amount of respect for their efforts in actually filming little bits, creating CGI animations, finding snaps and clips from other episodes to piece in as appropriate, adding a text scroll of stage direction, etc. Loose Cannon FTW. on to the actual companions… I think most of the early companions are absolutely brilliant. I like competent female companions, when they’re not making coffee or screaming. Barbara, Zoe Heriot and Victoria Waterfield are all absolutely amazing. Sara Kingdom…alas, poor Sara (SPOILERS!). Very much agree with your rant about the media’s image of the show being the Doctor Plus One (female). I started watching when the crew was Tom, Sarah & Harry, so that’s always seemed the more natural format to me. Like Tansy, my introduction to the earlier companions was thru the Target books. My first non-Tom books were The Crusaders & The Zarbi, with Ian & Barbara, who were teachers, kind of off-putting for an 8 year old reader like me, & Vicki, who was okay until Maureen O’Brien did too good a job of playing a really scary Morgan Le Fay in BBC’s The Legend Of King Arthur (1979), which made me wary of all her other roles for several years. And those books were LONG, probably the longest I’d read at that time. Really, the Cybermen were much more exciting, on TV in Tom’s first season, and in the Target books of The Cybermen and The Tenth Planet. Those two novels gave me my very early mid-1970s exposure to the wonder that is Ben & Polly. I hadn’t really thought about it much, but now I see just how I was able to relate to those two companions when I was a kid. Ben was in the Royal Navy, just like my sister’s then-boyfriend, soon-to-be husband (married 36 years this week), and Polly was a secretary, like the ones in the office where my Dad worked. Hence, instant connection and understanding. And Cybermen! For my birthday this year, I received enough Hartnell DVDs that I got eight whole episodes of Ben & Polly (well, 7 plus one animated): The Tenth Planet which was really more about the crew of the polar base than the companions, and The War Machines which was the story I particularly asked for. Watching the nightclub scene where the two companions first meet, I was struck by the naturalness and modern-ness of it all. It’s really touching how Anneke Wills is so fiercely protective of the memory of Michael Craze (reminds me of Emmylou Harris re: the late Gram Parsons). Basically, next year, I’d like every single one of Ben & Polly’s episodes on DVD. And Jamie’s. Oh, and Hartnell’s. Not much to ask, I think you’ll find. Way back in the 1980s, I was lucky enough to attend the DWASocial 5 mini-convention at Hammersmith in London, remember being absurdly excited about seeing the director Graeme Harper in the flesh. What I didn’t realise until recently was that it was the only ever con appearance of Jacqueline Hill. Look, see, I still have my photo of the Hartnell Companions signing table. Left to right: Ben, Barbara, Katarina, edge of Susan’s nose. Visual proof. Oh my gosh! I had a few things to interject as I was listening along, but they all flew out of my head when Erika dropped her podcast bomb. I admit I was wondering what would happen when Steven and Josh finished their run on The Memory Cheats. Now I guess I know, and I am VERY excited! Take your time, have fun with it, and know there is an eager audience already chomping at the bit to take that ride along with you! Actually on topic: I agree that to my way of thinking Polly (or possibly Dodo) has the most to gain from seeing missing episodes. Tangentially related: The Highlanders is the missing story I would most like to see returned. Thanks for a spirited and amusing discussion! Ohmigosh. I can’t wait to try this!! That’s a really impressive spreadsheet. …but am I wrong, or is it missing an episode of The War Machines? Liz, your observation that Barbara reminded the Doctor of his wife is INSPIRED. I can only hope to continue watching Doctor Who with a fraction of the imagination you obviously bring to the experience. Tansy, the fact that you were raised on Doctor Who is the polar opposite of my upbringing. I am consistently impressed, episode after episode, by your insight, your factual knowledge, and your grasp of the big Doctor Who picture. Something for me to strive for. After nineteen years together, I can still surprise him with the bizarre and over-detailed facts I know about people who were in Doctor Who one time. The Doctor Who girl thing dates to way before Nicola Bryant. I have pinged across my Doctor Who tracking Excel spreadsheet. Just because. I love Ben btw and was a bit sniffy about Liz being so snarky about him but I’m old enough and ugly enough to get over that. On the subject of ‘The Underwater Menace’ I think people might have liked that more if the surviving episode had not been different. Certainly the newly recovered episode makes it look more fun. I think you can blame Jeremy Bentham for that opinion on ‘The Gunfighters’. His guide – in a book that I can’t remember the title of – set out a lot of what became established wisdom on black ‘n’ white Doctor Who as at the time we didn’t have relatively straight-forward acces s to them now. In my time as a Doctor Who fan I’ve seen Pertwee’s era lauded, given a kicking and then a bit of recovery. I love Season 17 – which is often whinged about. On the subject of wiped companions I think Vicki & Steven are fantastic. The Mythmakers is high on my stories I wish they’d find in an archive somewhere. Perceived Fan Wisdom (PFW) or the mythologising of the show stems from two very important publications back in the day. The Radio Times 20th Anniversary special, which listed all the companions and stories in order. And the Celebration book for the 20th Anniversary by Peter Haining, which did the same thing but in much more detail. At that point, these two constituted what we as fans knew about the show. This is where a lot of stuff we know now comes from. Bear in mind, we didn’t know much about these earlier stories in these days of (virtually) pre VHS and early Target novelisations. The one big thing lacking in the episode (which may be made up in a future episode) is there was no mention about finding the companions from the missing episodes in Big Finish Companion Chronicles audios. Having started viewing well pre-video recorders/DVDs, but also well after it started (around Sea Devils, I think), my early Who knowledge is almost entirely based on the Target novelisations. Thanks to those, I have a high opinion of Polly – with particular memories of her being pretty central to War Machines and downright ingenious in Moonbase – cooking up her Cocktail Polly to deal with the Cybermen, thanks to her knowledge of the chemical constituents of nail varnish remover. Regarding the missing episodes, can you imagine if we only had the Ribos Operation on audio, we would miss the real stength of Mary Tamm, which is her wonderful facial expressions especially her sarcastic and dismissive looks she reserves for the Doctor. I think Polly is utterly brilliant in the Highlanders, Ben shines in Power of the Daleks but the outstanding performance is Stevn in the Massacre, which has joined my top five stories.